Historic Music-Box Cylinder with pins. Photo by Glenn Looney. In the Previous-Installment of Museum-Notes, the impressive Guinness-Collection of Music-Boxes & Automata on display way over in Morristown, NJ, was enthusiastically noted. This was soon followed by an Invitation to the Steuben Flagship-Store’s Corning-Gallery at 667 Madison Avenue, where a fascinating exhibition of Historic & Modern Music-Boxes is now on view! While the handsome examples of the Fine-Art of Steuben Glass-blowing in the show-windows should be enough to lure you into this Flagship-Venue, downstairs the entire gallery is devoted to Music-Boxes new & old, as well as to some Automata. This interesting exhibit has been mounted by the Guinness-Curator, who has an excellent eye for what may be most impressive to both Collectors & the Merely-Curious. As Music-Boxes have become prized Collectibles, you won’t find many bargains if you begin to collect, even in Thrift-Shops & Antique-Stores. Fortunately, you could begin your own Collection by acquiring new Music-Boxes, hand-crafted in Switzerland by the historic firm of Reuge! There is even a handsome book at the gallery for you to take home: REUGE: The Art of Mechanical Music: Secrets of the Reuge Manufacture. Not only does this volume—richly-illustrated with color-photos & old prints—demonstrate the process of making a Music-Box, but it also showcases some of the gleaming new creations of this time-honored factory. Setting the tiny metal-pins in the Brass-Cylinders so that they will cause the prongs in the gleaming Metal-Combs to sparkle with the melodies of Brahms, Chopin, Strauss, Shostakovitch, or even George Gershwin & Chic Corea, is not a simple task. A few of the wonderfully-crafted Music-Boxes are topped with Singing-Birds, long a specialty of Reuge. If you collect the beautiful Elisa model, you will have something Very-Special: all the tunes were composed by Women! Felix Mendelssohn’s sister, Fanny, is on the Cylinder, along with Germaine Tailleferre, Clara Wieck-Schumann, Amy Beach, & the much-married Muse & Mistress-to-Geniuses, Alma Schindler-Mahler-Gropius-Werfel! Henry Darger, At Battle of Drosabellanaximillian. Seeing Glandelinians retreating Vivian girls grasp Christian banners, and lead charge against foe. Photograph: Courtesy American Folk Art Museum, New York. Over a decade ago, only a few Folk-Art Experts were praising the voluminous water-color artworks of the "Outsider-Artist" Henry Darger & his almost-endless typed-manuscripts of the exploits of the Vivian Girls & other Bizarre-Fantasies, inspired by ads & illustrations from our Popular-Culture. Thanks to the efforts of the American Folk Art Museum & Galerie St. Etienne—where I first saw examples of Darger’s odd visions—a much wider public is now aware of this reclusive janitor’s real Life-Work, created in private for no other audience than himself. Although there is no apparent record of Darger getting into trouble with Underage-Children, one has to wonder at the Suppressed-Sexuality of a lonely bachelor who drew hundreds & hundreds of Naked Little Girls with Vestigial-Penises! Currently, some of the Folk Art Museum’s important Darger artworks are on show as a counterpoise to over 40 works of art by 11 academically-trained Contemporary-Artists, all of whom have been in some way influenced by Darger’s Styles & Subjects. Among the Trained-Artists on view are Amy Cutler, Grayson Perry, Jefferson Friedman, Anthony Goicolea, Paula Rego, Justine Kurland, Michael St. John, Justin Lieberman, Yun-Fei Ji, Robyn O’Niel, & Trenton Doyle Hancock. Among the varied works on view, my favorite is Grayson Perry’s goldly-gleaming ceramic-vase: He Comes Not in Triumph. Deeply-incised lines define both people & architectures on a golden-base, with Darger-like Pale-Colors for clothing. A bearded man in bib-overalls holds up what looks like a Vivian-Girl for the adoration of Wounded & Maimed victims. These drawings are overlaid with reproductions of rectangular-photographs, possibly suggesting Darger’s dependence on images from magazines & newspapers. There are 12 Darger water-colors in the show, as well as one of the journals from his more than 15,000-page manuscript: The Story of the Vivian Girls, in What Is Known as the Realms of the Unreal, of the Glandeco-Angelinnian War Storm, Caused by the Child Slave Rebellion. For most of the 19th Century, Americans who wanted to become Sculptors in Stone or create great bronze sculptures went abroad to learn the crafts & master the arts. Horatio Greenough could not have trained effectively in Boston or Philadelphia. The idea of being a Sculptor in Wood wasn’t thinkable: those people were Wood-carvers & they could fashion Ship-Mastheads or carve Carousel-Horses. Nonetheless, the young Upstate-New Yorker Asa Ames identified his Occupation for a Census as Sculpturing. He didn’t carve Mastheads, but his painted wooden Portrait-Busts of Family-Members & Erie-County Neighbors have somewhat the stiffness of some Masthead-Portraits. In fact, they look rather like three-dimensional evocations of the often solemn Family-Portraits painted by Itinerant-Painters traveling the Country-Roads of New England. As Asa Ames died of Consumption at age 27 years, 7 months, & 7 days, he was not able to create a large body of work. Only 12 surviving-pieces are known, 8 of which are now at the Folk Art Museum. In addition to the Portrait-Busts, there is a life-sized figure of Ames’ niece, Susan, a chubby Naked-Child, & an Obviously-Allegorical Seated Female Figure with Lamb & Cup. One bust is not Portraiture: It is a Phrenological-Head, with various sections of the brain marked in colors with the Functions they were believed to Control. Earl Cunningham’s America examines the paintings of Earl Cunningham (1893–1977) at the American Museum of National History. If you ever are in Orlando—the actual city, not Disney-World—you will see a number of Earl Cunningham’s most vivid Land & Seascapes. The local Mennello Museum has a variety of Folk-Arts on view, but its Cunningham-Collection is certainly the most colorful. A number of these depict Florida-Scenes, as he settled there in 1949. But he was born in Maine & went to sea, at one time on a cargo-ship sailing up & down the Eastern-Coastline from Maine to Florida. So Cunningham painted a lot of Ships. Early-on, he would sell these for 50¢! If any of them has survived, it is worth considerably more now that he has been Discovered. Cunningham used such bold basic colors that one’s first impression of a wall full of his paintings is of the Riot of Color, rather than of the actual subjects depicted. The sharp-contrasts of Deeply-green Palm-fronds against intense Orange or Yellow-Skies are always arresting. The current Manhattan show—at the Folk Art Museum’s Lincoln-Center-Location—offers an exploratory range of Cunningham’s favorite subjects. It has been organized by the Smithsonian-Institution & it is traveling under the Gracious-Patronage of President George & Laura Bush! Even decades before the American Museum of Natural History devoted a Blockbuster-Show to THE HORSE, it had been celebrating this Most Noble of Animals on its front steps, with the Heroic Sculpture-Group that presents Rough-Rider-President Theodore Roosevelt astride a Powerful-Stallion, flanked by Two-Representatives of the Less-Fortunate Peoples of America, the Indians & the Negroes. During the current exhibition, however, the over-awing-effect of this Larger-Than-Life Tribute to the Great-Hunter—played in the Museum-movie by Robin Williams!—is immensely-enhanced by the huge red banner, featuring a Giant White Horse’s-Head, that hangs behind these sculptures, between the Museum’s two majestic Entrance-Columns. Teddy Roosevelt—arguably the last Great-Republican-President—loved going on Safaris & Hunts, in order to shoot Big-Game. This could be stuffed & sent back to the Museum. They needed specimens for all those Dioramas, after all. Killing Wild-Animals was what Real-Men did back in those days. But Roosevelt was no Savage-Predator: he refused, so the story goes, to shoot a little bear, flushed out for his shotgun. Hence, Teddy-Bears! Roosevelt was also one of our first Preservationists. Without his strong-support & Presidential-Powers, we would not have the Wilderness-Lands & the National-Parks we now enjoy—despite the concerted-efforts of recent Republican-Presidents to damage or destroy that National-Legacy. The "Hero of San Juan Hill" was also a great lover of Horses. He even went Way Out West, as an ailing young-man, to recover his health as a Cowboy! He wrote a book about it: The Strenuous Life. He would have loved the new Horse show at the Museum! The Origins of the Family of Horses goes back some 55 Million-Years, give or take a Millennium or two! At least that’s the Claim made in the stunning new exhibition at the American Museum of Natural History. Eohippus is in there somewhere. From fossil-traces, the Eons-old Precursor of the Modern Horse was only the size of a Large Fox, standing 10 inches high at its shoulders, with four toes on its front feet & three on its back. Then how does it happen that the Horses known & used for Millennia have hooves, instead of toes? The Press were taken Behind-the-Scenes, where Darrin Lunde—an expert on Vertebrate-Fossils—showed how earlier forms suppressed the extra toes, standing, finally, on the Middle-Toe, which became the Hoof of the Horse. Its Relative, the Giraffe, stands essentially on two-toes. The new show is laid out like a maze or a labyrinth—but with no dead-ends or cul-de-sacs—to make maximum-use of the available exhibition-space. Isbelle sculpture by Deborah Butterfield. 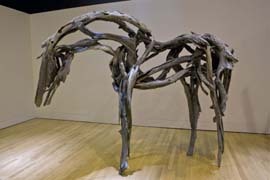 Artist Deborah Butterfield created this sculpture from Hawaiian ohia wood and then cast it in bronze. © AMNH/D. Beginning with Fossil-Remains, the Evolution of the Horse is followed through Primitive-Representations on Cave-walls, through Classical-Antiquity, on to the Dark Ages & The Renaissance, We do not get Knights-in-Armor, but at least there is one Battle-Horse in Armor. 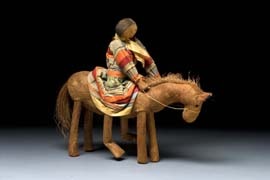 After exploring the Primitive & the Historic-Past, the show focuses on the Use of the Horse around the World, showing its roles & functions in many Ethnic-Environments, including the Saddles, Bridles, Harnesses, & Decorations created especially for horses. Moving on to Modern-Times in the West, more or less, there is even a vintage New York City Steam Fire-Engine: horse-drawn, but with steam to spritz the water into burning buildings. You will not see a team of four or six horses pulling the Fire-Engine. If all the Artifacts on view had the Horses that belong to them—or vice-versa—the exhibition-space would have had to be twice as large! One Object I missed—though it is shown in photographs—is The Plow That Broke the Plains. Of course the Fire-Engine is a kiddie-delight, but the Mold-Board-Plow—pulled by a team of two horses, or only one, if the soil was soft—was the Rural-Tool that helped feed & develop America. Of course, with the help of the Horse! The Plow That Broke the Plains is one of the Great-Documentaries about the Making of America. 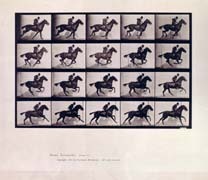 It is in the Film-Archives of the Museum of Modern Art. Do see it! Horse-racing & Harness-racing are not neglected. As well as some of the Trophies won. After all, Racing Thoroughbreds used to be called THE SPORT OF KINGS, followed closely by Royals Playing Polo! But on the Opening-Day—at the 81st Street Entrance to the American Museum—the World’s Smallest Horse, Thumbelina, was on hand: standing only 17 ½ inches high! Shoeing-Horses was also demonstrated, as well as grooming & mane & tail-braiding techniques. The ASPCA showed a horse-drawn Equine-Ambulance! There is, of course, a Horse-Themed Shop at the show’s exit! Usually, the American Museum’s restaurant has Show-Themed food-specialties. But there are no Horse-Burgers for this exhibition, even though Horse-Meat is eaten in some Civilized-Countries such as France. If you see a Golden-Horse-Head on the façade, it could either be a Stable or a Butcher-Shop. Horsemeat has a slightly sweet taste. But you wouldn’t want to eat Black-Beauty—or National-Velvet—anymore than you’d eat Bambi’s Mother, would you? The Horse has been designed for other major Natural History Museums as well: Ottawa, San Diego, & Chicago. Not to overlook the Abu Dhabi Authority for Culture & Heritage! Camels are also essential in Arabia, but they aren’t as handsome as Horses. 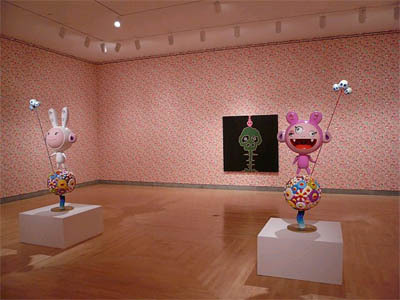 © MURAKAMI exhibition is a retrospective of the work of Japanese artist Takashi Murakami. Some seasons ago, the Concourse before the RCA-Building in Rockefeller-Center—where the Giant Christmas-tree stands in the dead of Winter—was crammed with the colorful cartoonish creations, large & small, of Takashi Murakami, the Brand-Name Japanese Multi-Faceted Artist-Entrepreneur. Central was an immense Trademark Murakami Figure, suggestive of some influential Japanese Anime Subjects & Objects. Spread out around this creation was a sprinkling of smaller sculptures & constructions, some resembling Toadstool-People. You could sit on them, so I did, along with shoals of Kiddies having Fun. Now you can have the Definitive ©Murakami Experience over on Eastern Parkway, at the Brooklyn Museum—which not so long ago called itself the Brooklyn Museum of Art. Why the name was changed back to what it had been for many years was not because someone realized that what the Museum was showing in its recent Blockbuster-Shows had less to do with Art than with Product-Placement, but because the Brooklyn Museum has important Archeological, Ethnological, & Historical Collections, as well as Paintings & Sculptures. The current show Out-Rockefellers that delightful Rock-Center show, as the foyers & lobbies are overhung with ©Murakami Creations, which also fill floor-spaces. Two floors of Upstairs-Galleries are devoted to the varied mutations of ©Murakami artworks in the forms of Sculptures, Paintings, Videos, & even Densely-Patterned-Wallpaper! Although ©Murakami has been inspired by Historic Japanese Artworks & Artforms, the most powerful influences have been Anime & Manga: Animation & Comic-books. The influence of Comics on the Arts now seems to be pervasive: Superheroes is the new Met Museum Blockbuster, neatly coinciding with the debut of Iron Man & also using Robert Downey, jr’s Super-Suit in the show! What is most often arresting in the ©Murakami works—aside from his generous use of warm & bold colors—is the occasional ferocity in what, on first glance, seem to be stylized cartoon-forms. Like a Kewpie-doll Head that is dominated by a wide, wide mouth full of sharp steel teeth! At the April Asian-Art sales at Sotheby’s, one of ©Murakami‘s multiple-copy Sculptures was up for auction. Another copy was also on view at the Brooklyn Museum. This is the buff plastic Cowboy who is twirling a spiraling torrent of his Ejaculated-Sperm around his head like a Lasso. Then there’s that controversial Louis-Vuitton Handbag-Shop, with a distinctive ©Murakami pattern on the wares. This has really annoyed some Serious Art-Critics, but Branding & Marketing are really what ©Murakami is all about. ©2008 Takashi Murakami/Kaikai Kiki Co., Ltd. All Rights Reserved. Why else would the ©Murakami Artist have developed a highly-complex ©Murakami Corporation with ©Murakami factories not only in Tokyo, but also in Long Island City, where ©Murakami copies of his ©Murakami Artworks are routinely manufactured? Like ©Jeff Koons—most of whose Artworks seem but Appropriations from Our Popular Culture—©Murakami does not personally make all of the ©Murakami wares offered for sale. Like ©Koons—who has long employed skilled Italian-Craftsmen to fabricate the three-dimensionals of his metallic Balloon-Dogs & Rabbits or his Ceramic Michael Jacksons with Monkeys—©Murakami creates the Original-Designs which are then replicated in one of his Factories. Actually, the Design-Perfection of ©Murakami—as well as the numerous replications of pattern-details in Larger-Patterns—would seem to have been perfected Digitally. ©Photoshop, anyone? The Brooklyn Museum’s Mantra in promoting this Nipponese-American Blockbuster is that ©Murakami‘s work is a fusion of Fine-Art with Popular-Culture. Depends on what you believe Fine Art to be in these Rudderless-Times. Takashi Murakami’s immense silver Oval Buddha is standing-tall in the Atrium of the IBM Building, as a Pendant to the Brooklyn Museum show. It is a complex, towering Image. Covered with gleaming Platinum, this Two-Faced Buddha of aluminum & steel is over 18 feet tall. Inspired by Historic Arts & Crafts of Old Edo, the sculpture is also a Symbolic-Portrait of an aging ©Murakami, as the free three-fold brochure explains to visitors. Nonetheless, some of the office-workers sipping their coffee at the surrounding-tables seem completely oblivious. Records continue to be broken at auctions at both Christie’s & Sotheby’s. A Monet sold for some $41-million, but in several sales lesser works by Big-Names failed to sell at all. Just who decides—and how—a Picasso or a Warhol is Second-Rate may ultimately be decided/indicated by the lack of Bidders, as well as Art-Critics reporting on the sales. Photography—not so long ago barely considered an Art or desirably Collectible—posted Major-Wins at Christie’s in April. A week of sales totaled $17,608,525! Diane Arbus photos from the Bruce & Nancy Berman Collection sold-out 100%, with the top-lot going for $115,000. This was Arbus’ pathos-ridden Child selling plastic orchids at night. A family on their lawn one Sunday in Westchester, N. Y. 1968 sold for $91,000. Of course these are Original-Prints by Arbus, not copies. An outstanding selection of Ansel Adams photos from a California-Collection achieved $4,678,000. His dynamic photo-mural print of Clearing Winter Storm, Yosemite, 1944 was purchased for $481,000. Those Yosemite Tourists of long, long ago who bought inexpensive Adams prints from the Master himself in his little photo-shop near the Indian-themed Ahwanee Hotel could not have realized how valuable these would one day become. In early May, three days of auction-sales at Christie’s for Impressionist & Modern Art totaled $325-million! Citing such figures—as both Christie’s & Sotheby’s are wont to do—suggests that these sales are less about Art & more about Commerce. But there is something of an Obscene-Fascination about these surging-prices for Masterworks of Art when the National-Economy is Collapsing. Christie’s Works on Paper section of the sale noted above brought a total of $16.7 million. The subsequent Day-Sale fetched $14.2 million. The Paintings & Sculpture section of Impressionist & Modern Art achieved $277,276,000! Your Scribe was felled by the Norwalk-Virus for much of the month of April—and on into May—so was unable to pay close-attention to the various treasures up for sale in several important categories. But it may well be—as the Economy continues to Implode—that more & more Second-Tier artworks & objects-d’art sent for sale will not find bidders. Do not expect Geo. W. Bush to alleviate this Mood with yet another Optimistic-Speech. 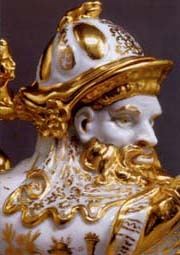 Teapot and Cover (detail), Meissen porcelain. The Arnhold Collections. After the large-scale Meissen-Porcelain creations recently shown at the Bard Grad Center Gallery—designed as Diplomatic-Gifts to Major European Royal-Houses—the much smaller & more delicate Meissen ceramics from the Arnhold Collection, now on view at the Frick, do not seem quite so impressive. Nonetheless, most of them are of such a high-degree of artistry in Modeling & Decoration that close-examination is well worth your time. There are magnifying-glasses on hand. Actually, only a hundred of the large Arnhold holdings are on display in the Frick’s intimate galleries. These will only be shown at the Frick. The Collection has never before had a Major-Exhibition. There is a wide range of porcelain objects on display, but the Poster-Boy—a Warrior’s-Head as Teapot, with a gilded-helmet for a lid—is one of the most fanciful & imaginative of the many treasures. A Cruet & a Mustard-pot—both with Chinese-figures riding ceramic-roosters—are also unusual. For those who think of Dresden-Porcelain in terms of those dainty figure-groups in 18th Century Costumes—many created & painted by Meissen’s Johann Kändler—the founding-collector, Heinrich Arnhold, initially was not so interested in them, preferring vases & wares, such as tea-services & ewers from the earliest times of the Meissen-Manufactory. Dresden’s Electoral-King, Augustus the Strong—also King of Poland—was so fascinated in amassing treasures & riches that he bought the Phamacist/Alchemist Johann-Friedrich Böttger to Dresden to transform base-metals into Gold. With the aid of the Philosopher’s-Stone, that is what Alchemists were supposed to do. Seldom were successes reported, but it was said that Böttger had indeed turned the trick! Once in Dresden, the unfortunate Böttger was clapped in Prison. Augustus hoped any secrets he learned would not be spread about. Even as a prisoner, Böttger set to work, but what he discovered were the secrets of the manufacture of both white-porcelain & the red-stoneware, known as red-porcelain. which no one in Europe had yet mastered. Of course, the fact that the essential white-clay, or Kaolin, was not known to or available to them was an insurmountable-obstacle… Nor did most realize how high the firing-temperatures would have to be. Augustus had already been collecting porcelains imported from China & Japan. He had some 20,000 objects by the time he decided he should display them in the so-called Japanese-Palace. So the new factory began with objects copied-from or inspired-by these objects-d’art. Later, European styles & designs would become the mainstay of the growing production. Thousands of such pieces were specially designed for the Palace. Some of the most impressive items in the Arnhold Collection were made for Augustus’ Japanese-Palace. The Collection has been extended by Arnhold’s son, Henry, his mother having brought it to New York from Dresden in 1940, shortly after World War II began. Dresden is the Capital of Saxony, but its Elector, Augustus, established his Royal Porcelain Manufactory in the nearby town of Meissen, so Dresden & Meissen are virtually interchangeable-names for this porcelain. A. Maslov [Victor Slama]. List 5-Communist Party. With the collapse of the Kaiserreich at the close of the Great War—Kaiser Wilhelm II went into a Dutch-Exile instead of being treated like a War-Criminal—a United Germany’s first-ever attempt at Democracy was launched in Weimar as the Weimar Republic. But the Economy was in Chaos, with Paper-Currency & even Stamps repeatedly printed-over to raise their Value, even though they were valueless. For some very Worried-Workers, a form of Soviet-Communism seemed the answer. For others—especially Farmers & devout Catholics—the more Authoritarian programs of Hitler’s National-Socialists had more appeal. Thus, for Out-of-Work Workers, there was a Choice. For those on the Left, Communism was the Hope of the Future. For those on the Right, Communism was a Menace that had to be rooted-out. Both sides used powerful Posters & Graphics to win people to their opposing Causes. But the current exhibition at Galerie St. Etienne concentrates on Communist-Oriented artists & artworks. In addition to some powerful lithographs & posters by Anonymous-Artists, there are also a number of important works by George Grosz, Käthe Kollwitz, A. Malsov, Lea Langer Grundig, & John Heartfield. Heartfield invented the Photo-Montage, especially as used for satiric purposes & political-comment. Those that appeared on the front-pages of Die Volks-Illustrierte are now rare Collectibles. Some of Heartfield’s montages are quite savage. There are almost sixty lithographs, etchings, posters, & photo-offsets in the new show. If you are interested but cannot stop by the gallery, the exhibition is on-line at www.gseart.com. Here you will also find the Gallery’s History, its Inventories, Artists’ Bios, & past Checklist-Essays. Jane Kallir’s essays are always informative, even provocative, so you will find the current backgrounder on the exhibition most valuable, even if you are not a Collector. For the Record: John Heartfield & his brother Wieland Herzfelde are buried side-by-side in the Protestant-Cemetery in the former East-Berlin, just a few steps from the graves of Bertolt Brecht & Helena Weigel. At the Auer-Dult in Summer 1957, Your Scribe had the opportunity to buy a run of the Volks-Illustrierte, with Heartfield’s photo-montages. I liked them a lot, but the paper was deteriorating, so instead I bought issues of the Berliner-Illustrierte from the early 1940s, with sepia-photos of the Blitzkrieg over London. But how did Goebbels’ Nazi-Editors get those photos—taken down in the streets around St. Paul’s Cathedral—back in Berlin only hours later? Fifth-Column photographers? Following the intriguing exhibition of Hansel & Gretel-inspired drawings, cartoons, paintings, & constructions dealing with the theme of Abandonment, the new Metropolitan Opera Gallery salutes Philip Glass, composer & co-librettist of the Met’s new production of Satyagraha, an homage to M. K. Gandhi & his development of the concept of Non-Violent Resistance to Social-Oppression. A range of artworks evoking Gandhi & his struggle in South Africa, where Indian-Immigrants were being badly-treated would have been especially relevant. As would color-sketches & working-drawings of the Giant-Puppets used in the opera. But no. Instead, the walls are hung with 18 large portraits of Glass made by the Pixel-Dot artist Chuck Close. They span some 40 years of the artists’ friendship, from 1968 to 2008. Most of these Mug-Shots are now almost Iconic, so often have they been reproduced. Glass’s distinctive face & unruly hair are recognizable even as he ages. Indeed, most New Yorkers, seeing these shots, can tell you at once that they are by Chuck Close, owing to his Trademark-Techniques. Just as many can tell you: "Oh, that’s Philip Glass! You can’t miss that mug!" One gallery-visitor did tell me that she thought the images were of Tom Stoppard—there is a passing-resemblance—even though all the wall-labels insist that this is in fact, Phil Glass. In the Close/Glass show, one of the most interesting Glass-Images can only be appreciated when a gleaming Stainless-steel Cylinder is standing in its exact center. The actual print looks like the blades of a round Fan, with large & small dots of black on white. Reflected in the curves of the Cylinder, an Iconic Image of Glass comes together. Painters have been using this Optical-Trick for several centuries. But it is still an Astonishment when used today. 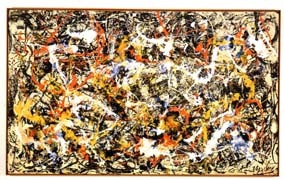 Jackson Pollock, Convergence, 1952, oil on canvas. Albright-Knox Art Gallery, Buffalo, N.Y., Gift of Seymour H. Knox, Jr., 1956. © The Pollock-Krasner Foundation/Artists Rights Society (ARS), New York. You don’t have to be Jewish to be exhibited at the Jewish Museum. But there needs to be a Connection. In the attractive new show, Action/Abstraction, the Mainspring is provided by the rival Critiques of the two major Jewish Art-Critics in New York, Clement Greenberg & Harold Rosenberg. They were largely responsible for bringing the work of artists such as Jackson Pollock & Willem de Kooning to National & even International-Attention! Of course, the Attitudes & Concepts of the artists themselves, as well as the adjustments made in American Popular Culture, long accustomed to Landscapes & Figurative-Painting—are also noted. Willem de Kooning, Gotham News, 1955, oil on canvas. Albright-Knox Art Gallery, Buffalo, N.Y., Gift of Seymour H. Knox, Jr., 1955. 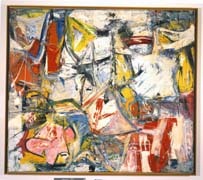 © 2008 The Willem de Kooning Foundation/Artists Rights Society (ARS), New York. For many Popular-Commentators—as well as just-plain-folks on outings to Art-Museums—the paintings produced by Abstract-Expressionists were either Mysteries or Objects of Ridicule. Fortunately, the reviews & critiques of Messrs. Rosenberg & Greenberg—although they occasionally contradicted each-other in what they saw or understood in various artists’ works—helped Serious Art-Lovers come to appreciate such oddities as the All-White & All-Black canvases of Ad Reinhardt or the drips & spatters of Pollock. The two men—there were no Women Art-Critics of their stature at that time—had blind-spots. The works of Grace Hartigan & Lee Krasner, Pollock’s better-half, were effectively dismissed. While the show focuses on the all-important First-Generation of Abstract-Expressionists—who were responsible for moving the Center of Artistic-Innovation from Paris to New York!—some of those who followed are also show-cased. There are some Context-Rooms, providing insights through letters, reviews, photos, & film & video-clips. Lee Krasner, Untitled, 1948, oil on canvas. The Jewish Museum, New York. Promised gift of Craig and Caryn Effron, P.1.2008. © The Pollock-Krasner Foundation/Artists Rights Society (ARS), New York. But what’s most important about this exhibition is the opportunity it offers to study Modern-Masterworks by the likes of Hans Hofmann, Arshile Gorky, Mark Rothko, Clyfford Still, Barnett Newman, Helen Frankenthaler, Morris Louis, Jules Olitski, Jasper Johns, Claes Oldenburg, Lee Bontecou, Philip Guston, & Frank Stella up close. You even get a nod to Allan Kaprow & Happenings, as an add-on! This Spring & Summer, we are celebrating the Death-Day—not the Birthday—of America’s most-distinguished Crossover-Choreographer: Jerome Robbins. He died on 28 June 1998, so this is a sort of Ten-Year Retrospective-Salute, with possibly many more to come. His achievements on the Broadway-stage rivaled his triumphs on the Ballet-stage. His choreographies for Fancy Free, On the Town, West Side Story, Gypsy, & Fiddler on the Roof are now the stuff of Legend. More significant—at least for lovers of ballet & modern-dance—are such masterly choreographies as The Cage, Dances at a Gathering, Goldberg Variations, & Watermill. Photos, posters, letters, memorabilia, costumes, & videos help flesh-out this show in the NYPL’s Performing-Arts center. But it isn’t only about his career as a dancer & choreographer. Robbins also got into trouble with the House Un-American Activities Committee—HUAC—which is not ignored in the exhibition. But his great Love of New York City is also celebrated, an affection that shown brightly in some Broadway choreographies, more than on the ballet-stage. There is a handsome free brochure accompanying the exhibition, providing a great deal of information worth keeping in your files. He won Five Tonys, Two Oscars, & Three Honorary Doctorates, among many other awards & achievements. One of these is the naming of The Jerome Robbins Dance Division at the Lincoln Center Library! Robbins was a great aid to Dance-Archivists! [Personal-Note: When I was writing Unsung Genius: The Passion of Dancer, Director, Choreographer Jack Cole, Robbins refused to answer any of my numerous requests for information or personal-memories, although he knew Cole very well. [When the book was still in galley-form—apparently an Editor had shown it to him—he tried to suppress it. Failing that, his attorneys sent my agent single-spaced pages of deletions & changes he demanded in my text. [Notably, he demanded the removal of a quote from Agnes de Mille—as a Foreword to the text—including him with several other outstanding choreographers whom De Mille said had been influenced by Jack Cole! [Agnes, of course, stood by what she had said. A damaging book-review in Vanity-Fair—signed but not written by Robbins—was the net-result. [Not wanting to write a Sour-Grapes letter to VF, I asked 4-time Tony-Winner Gwen Verdon & Lee Theodore—both of whom had been immensely helpful with my research—if they would write letters supporting the book. 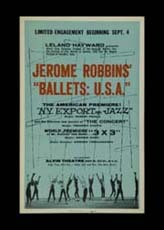 [They regretfully declined, both fearing Reprisals, especially Lee, who had some Robbins-Choreographies in her American Dance Machine repertory: "You don’t know how nasty Jerry can be…"
[Gwen Verdon & Jack Cole had an LA Club-Act—as well as working for Harry Cohn in Movie-Musicals—which Robbins used to come to see. 1. 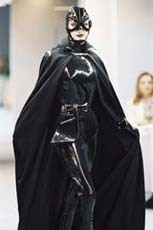 Thierry Mugler, fall/winter 1996-1997, Photograph © copyright Patrice Stable. 2. 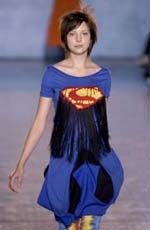 Bernhard Willhelm, spring/summer 2006, Photograph courtesy of Chris Moore. 3. Thierry Mugler, spring/summer 1992, Photograph © copyright Patrice Stable. Product-Placement could well be the subtitle of this Summer Crowd-Pleaser Blockbuster Met Museum Show! If you are a Big-Fan of Robert Downey, jr, or you just saw Iron Man, it may be fun to see the Actual Iron Man Outfit Downey actually wore in the movie! But Spidey is also on view, as are Superman, Wonder-Woman, & all the other Super-Powered Legendary Comix-Heroes of Yesterday & Today. You can even see Clark Kent transform into Superman! There are also Vintage Comic-books on display, as well. But this show is not entirely a Promo for Action-Comics. Some Sixty-Ensembles—some with Space-Age Accessories—celebrate not only Movie-Heroes & Heroines, but also avant-garde haute-couture, & High-Performance Sportswear. The Purpose of this handsomely-designed show—aside from providing a really-Trendy theme for the Costume Institute’s fund-raising Gala—is not to sell Lycra Running-Suits or Nike Sneakers. No no no! In this labyrinthine-show, one can stand astounded—even Marvel, to borrow a Trademark-Name—at Batman in full bat-drag, Catwoman who represents The Paradoxical Body [don’t ask], The Hulk as The Virile Body, X-Men, The Flash, & &&&&&&&&. But this show is by no means all about Comic-books & what was once called The Seduction of the Innocent. No Indeed! It is more subtly about Couture & The Big-Names. Here they are: Armani, Balencieaga, Cardin, Dolce & Gabbana, Gaultier, Ishioka, McQueen, Dior, Galliano, Moschino, Mugler, Versace, & Others. Nonetheless, Kids will love this show this summer. Then you can see the Rembrandts! Choosing Jeff Koons to adorn the Met Museum’s Roof-Garden from April to October is, of course, Excellent-Exposure, which the ever-opportunistic Koons certainly doesn’t need More-Of. Some critics have bracketed this three-piece-show with the ©Murakami show over at the Brooklyn Museum as dual-examples of Commercialism & Branding in Art. Whatever else you may be moved to say about the Artworks of Koons & ©Murakami, they are now so Identifiable in their Trademark-Forms & Copyrighted-Concepts, that Students of Contemporary Art-History—Art-History is being made even as you read this!—can spot their works & win High-Grades on what used to be Slide-Show Exams, but can now be conducted on Computers. 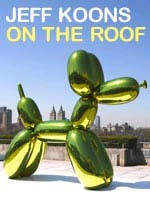 What you will see when you go up on the Met’s Roof—aside from Terrific-Views of Central-Park & Manhattan—are three Koons-Artworks. There is a huge chartreuse Doggie, looking like Inflated-Balloons, but actually made out of high-chromium stainless-steel & coated with that wonderfully-gleaming transparent-color. There is ample room on the Iris & Gerald B. Cantor Roof for at least a Fourth-Piece, but, no, it is just empty-space for viewing the trees, if not the forest, of Central-Park. Nothing of note on the Garden-Walls, either. THE NORMANDIE’S THE HISTORY OF NAVIGATION TO BE RE-INSTALLED! Although the Met Museum was given 56 panels of the gilded-glass Mural that once graced the First-Class Grand-Salon of France’s premiere Ocean-Liner, the Normandie, only 28 of them had ever been on view. These were hung over the bar of the Atrium-Restaurant that had to disappear for the new Greek & Roman Galleries to be born. They were returned to storage in 2002. Now all 56 will be shown, as the centerpiece of a new show: Masterpieces of Modern-Design: Selections from the Collection. This will run until mid-October. As the panels are 20 feet high, the gallery had to be restructured to permit them to be seen in all their gleaming Splendor. In Jean Dupas’ Art-Deco designs, Navigation is evoked not only by Majestic-Ships, but also by Waves, Sea-Serpents, & other Mythical-Creatures which put fear into the hearts of Medieval-Voyagers, setting out into the Great-Unknown. As the Earth was then Flat—until Columbus insisted Otherwise—you could sail right off over the edge of the World! 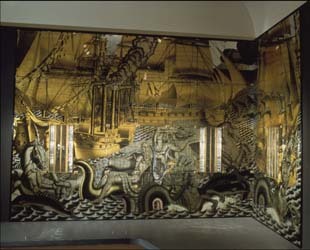 The Normandie-Panels—each section of heavy glass-plate weighing 40 pounds—were created with the technique known as verre-églomisé, which involves reverse-painting on the gilded glass. Unlike the tragic Titanic, the Normandie did not go down at sea. Instead, it caught fire in its West-Side dockage, Pier 88, filled with fire-fighters’ water, & turned over on its side. Raised 18 months later, it was cut up for Scrap. But it had served nobly in World War II as a Troop-Ship. Could the Saga of the Normandie be another Leo DeCaprio Blockbuster movie? It is a rare occasion when the pages of a priceless Medieval-Illustrated-Manuscript are dis-assembled. Whether this is dictated by preservation & restoration, facsimile-photography, or simple re-binding, it permits each page to be on display, even if only for a short period. Currently at the Morgan Library, some small-scale & intricately-detailed Illustrated-Manuscript pages are on view. The book is Le Livre de la chasse, or The Book of the Hunt. 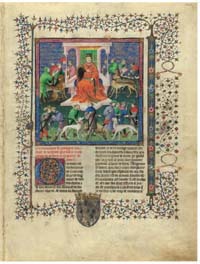 It was written by Gaston Phoebus between 1387-1389. Although the Morgan has one of the largest collections of Medieval Bound-Books & Manuscripts in the world, usually only one or two open-pages of one of these Treasures can be shown at a time. Fortunately, the Book of the Hunt was taken-apart & photographed for wider-enjoyment in a handsome facsimile-edition, which even reproduces some faults in the original vellum. The Facsimile is on view, so you can leaf through it to look more closely at Hunting-dogs being combed, washed, dried, & otherwise groomed. Details of a Medieval-Hunt are also fascinating, not least because you can easily see the distinctions between the activities of the Noble-Hunters & their Peasant-Serfs. One large illustration shows Bears at Ease & at Play. On another page you can study the pursuit of a Bête Noir. This means something else today, but back then, it was a Wild-Boar! There are also similar hunt-images from Persian/Indian manuscripts, as well as 8 printed-books on the Hunt, 12 Medieval & Renaissance illuminated-manuscripts of Hunting from English, Dutch, Flemish, & French originals. Philip Guston, Untitled, 1968, Charcoal on paper, 45.4 x 57 cm (17 7/8 x 22 ½ in), Private Collection, © Estate of Philip Guston, Courtesy McKee Gallery, New York, Photo Credit: Sara Wells. 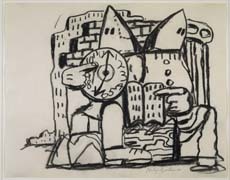 If you knew nothing about the notable career of Philip Guston & simply gazed as some of his Works on Paper, such as his thick black-lined Hooded-Klansmen, his Phlebitic Richard Nixon, or his pile of Untitled (Cherries), you might regard these works as amusing, if coarse, Cartoons, rather than Fine-Art. Of course, you would be very Wrong—or merely Art-History-Ignorant—especially if you go into the opposing-gallery at the Morgan, where Guston’s powerful Abstractions are on view. While his Celebration is a free-flowing Abstraction with bold black lines, it also suggests Two Klansmen in their Hoods! A number of his skittery Abstractions have a compelling fascination to them. Especially his Drawing Related to Zone (Drawing No. 19). But it is not easy to distinguish them by their titles, when so many are simply labeled: Untitled. What are Archivists & Art-Historians to do when so many Modern-Artists have so many Untitled artworks? Categorizing them by Year of Manufacture is a Start, but some, like Guston, with a frisky charcoal in hand, could easily churn out more than one per year, per month, per week, or even per Day! If any of the rank-&-file members of the Municipal Art Society are worried about Outsourcing-Abroad, one heard not a murmur at the recent 2008 Masterwork Awards for various categories of Architectural-Achievement in New York City. And yet the event was sponsored not by a Manhattan-based Foundation or Corporation, but, instead, by Helaba, the Landesbank of Hessen-Thüringen. Until the Fall of the Berlin Wall in November 1989, Thuringia was an East-German-State. In the meantime, they seem to have made a Very Good Recovery from the Economic-Disaster that was the DDR. Actually, if you take a close look at the credit-boards on each new Manhattan-building-site, you may be surprised to see how many of them are financed by various German State-Banks, not to mention other European-Union investors, as well as Israeli-speculators. Anyway, that’s just How Things Are. So, on with the Awards! The Awards-Nominating-Committee was composed of Four Architects [John Belle, Rick Bell, Gregg Pasquarelli, & Judith Saltzman] & One Mega-Developer, Jerry Speyer of Tishman-Speyer. The boring & sterile Exterior of the New York Times Bldg, with its see-through glass-cladding, contains an Environmentally-Friendly Interior, much of which can be viewed from the streets below. Architects: Renzo Piano Bldg Wkshp, also responsible for the new Morgan-Libe-Museum-Complex, & FXFOWLE. Interiors by Gensler. Barry Diller’s IAC Bldg has a fascinating, even voluptuous, Frank Ghery glass-clad Exterior, but its ground-floor open-spaces are fairly sterile, relieved by changes of colored-light behind some glass-panels. This is where the Awards were presented. The soaring white volumes of the building make a nice contrast to Chelsea-Piers across the highway. Diane von Furstenberg (DVF) Studio-Headquarters. Not far from the Ghery & virtually in the shadow of the new Mecca, the High-Line development, Von Furstenberg’s Studio HQ stands out among the ruins of the former Meat-Packing District. Two vintage tenements have been resto-modernized, with an impressive Geodesic-Glass-Something-Hydron on top. Is it just mere-coincidence that Barry Diller’s IAC Prize-Winning HQ is only a few blocks away from his wife’s Prize-Winning HQ? Diane von Furtsenberg is Mrs. Barry Diller, so they now have Matching-Awards to put on their Metaphoric-Mantlepiece. So much has already been written about the beautifully-achieved Historic-Restoration of the virtually forgotten & abandoned 19th Century Eldridge Street Synagogue that it seems excessive to say more. It is now functioning as a Museum, but you could still Daven here. Credits & Kudos to Walter Sedovic Architects! In former times, Under-Served, Poorer, & Minority-Communities in the City were provided with Floating-Baths; that is, if they were near the various water-fronts. The Floating Pool has been installed in an existing barge & was in use last summer at Brooklyn Bridge Park. 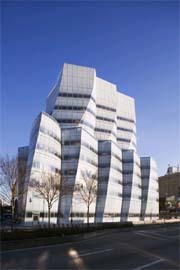 Gensler, of the NY Times Bldg, was the Executive-Architect for the New-Museum, a series of off-center stacked white-boxes down on the Bowery. Architects: SANAA—Kazuyo Sejima & Ryue Nishizawa. [Your Scribe unfortunately cannot report anything about this project as the New-Museum has never invited him to a Press-Preview or sent any press-releases along. Since January, St. Patrick’s Cathedral & other important Roman-Catholic Churches around the city have been adorned with banners celebrating the 200th Anniversary of Catholicism in New York. This was certainly one of the major-reasons His Holiness Pope Benedict XXVI flew over from Rome to bless this City & its People. Including ex-Mayor & ex-Presidential-Candidate Rudy Giuliani, who scandalized decent, right-thinking Catholics—especially Cardinal-Archbishop Edward Michael Egan, who had already forbidden him to take the Holy-Wafer of the Eucharist from the Pope, because Giuliani had not fiercely opposed Abortion, as is the Dogmatic-Duty of all Roman-Catholics. Then, there was also that matter of Two-Divorces & Three-Marriages! 1] How Catholic Community-Life revolved around city Parishes, beginning with St. Peter’s, old St. Patrick’s, & St. Brigid’s. When Immigrant-Italians & Irish arrived in New York—No Irish Need Apply!—they settled in low-rent enclaves, "among their own kind," as a Wasp-Commentator patronizingly-phrased this quasi-Ghettoization. 2] Creation of the important System of Health, Education, & Social-Welfare Institutions, including Parochial-Schools, the NY Foundling Hospital, & Hospitals such as St. Vincent’s in Manhattan & St. Mary’s in Brooklyn. The more Elitist-Protestant schools & hospitals initially did not welcome the Immigrants. 3] The Rise of Catholics in Public-Life, as exemplified in Wm. Grace, the first Catholic-Mayor of New York City, as well as Alfred E. Smith, New York State Governor, who was the first Catholic to run for the Presidency of the United States. American-Voters were urged to fear Smith being controlled by the Vatican! A Big-Point in this show is made about Anti-Catholicism in American Life & Politics from Colonial-Times. Initially, this was inspired by the strong Anti-Papist Protestant-Beliefs of the Settlers of New England, as well as the Anglican, Quaker, & other non-Catholic Confessions in the other Colonies. This show has the usual components of Photos, Letters, Documents, Banners, Citations, Arch-Episcopal-Ritual-Garments, & even a St. John’s University brochure for Catholic War-Veterans, urging the virtues of the GI Bill. The point of the latter-inclusion is not that US Taxpayer-Funds were being used to inculcate Catholic-Beliefs—though that, of course, was part of the course—but that the Bill permitted poor Catholic boys the previously-impossible opportunity of achieving a College-Degree, thus to be better able to compete in the Market-Place with the Protestants & Jews! If you have been driving or walking along Manhattan Waterfronts recently, you may have noticed workmen constructing what at first glance look like abstract-scaffoldings. But these are to become Waterfalls, designed by Iceland’s Olafur Eliasson. Of course, not all the rooms can play tricks on your Perceptions. The Moss Wall is exactly that! It is most interesting when some Art-Critics are carefully inspecting it, hoping to find out its Secret by looking at the moss-fronds up-close. 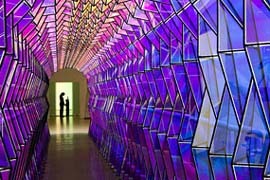 Olafur Eliasson, One-way colour tunnel, 2007, Site-specific sculpture, Courtesy the artist; Tanya Bonakdar Gallery, New York; and neugerriemschneider, Berlin, © 2007 Olafur Eliasson. In fact, most of the rooms with Optical-Effects of One Sort or Another are only really Defined when People are in them. This unusual show comes to Manhattan from SFMoMA, with some 24 additional works, with six of them specifically-created for this Exhibition! Segments of this show are also on view at PS 1 Contemporary Art Center in far-off Queens! For those Movie-Fans who had tired of the tunes of Dimitri Tiomkin or Max Steiner—as background for Gone With the Wind & other Period-Epics—the advent of Jazz-Scores for Major-Motion-Pictures was a Great-Leap-Forward, especially for hard-hitting Action-Films & sophisticated Comedy-Romps. To turn the spotlight on this change, MoMA is drawing on its immense archive of Hollywood & Foreign Films to show how Jazz-Scores indeed jazzed-up some important films. Among the Classics are Touch of Evil, Blow-Up, Knife in the Water, Mickey One, Paris Blues, Anatomy of a Murder, I Want To Live, Streetcar Named Desire, Man with a Golden Arm, Les Liaisons Dangereuses, Pull My Daisy, The Connection, The French Connection, Dilemma, Sweet Smell of Success, The Wild One, Breathless, Repulsion, Taxi-Driver, & How To Draw a Bunny! As such film-programs need a Lobby-Component—complete with Wall-Texts—there are colorful Movie-Posters, as well as drawings by John Canemaker for Bridgehampton & John & Faith Hubley for Adventures of an *. The Esquire Covers by George Lois. In 1961, Esquire—the Men’s Magazine—was near Death, saved by the new Editor, Harold Hayes, who had the Brilliant-Idea of commissioning George Lois to design new Covers that would not only raise the magazine to new Heights of Relevance but also goose its flagging Circulation. Of course there was dynamic, controversial New Content Inside, but what sells Mags on Newstands is Covers, not inside-interviews with Norman Mailer or Susan Hayward/Sontag/Sarandon. Before Lois came along, the premier Mag-Cover Illustrator was that National-Institution, Norman Rockwell. His Saturday Evening Post covers became Instant-Collectibles. Of course, as this show is functionally about Design & Graphics, there are also Posters, Graphics, & Typography! Installation view of Ateliers Jean Prouvé at The Museum of Modern Art, New York, 2008. Photo: Jason Mandella. If you are fascinated by Industrial-Design, Workshop-Interactions, Mass-Production-Manufacturing-Processes, & Final-Products, such as Jean Prouvé’s Modernist-Chairs, this is the show for you! 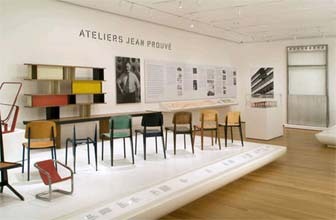 The exhibition focuses on Prouvé’s Standard Chair, designed in 1935, but put into full-production only in the 1950s. Curatorial-Explanations include this clue to the chair’s success on the Mass-Market: These chairs relied on the frame as a main structure, with forces of resistance concentrated on a central node. Considering the Neue Galerie’s recent full-scale reconstruction of Gustav Klimt’s Vienna-Atelier, the current display of Jugendstil-influenced Wiener Werkstätte Jewelry is very small-scale indeed. As are most of the pieces on view. 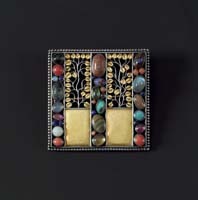 Several of the Josef Hoffmann brooches in the show are cast in a Modernist square-format, with thin silver-framings & vertical-channels, richly crammed with Gemstones & small golden-panels or gold-leaves. Considering that these were designed in 1904, 1907, & 1908, they present a strong contrast to the late 19th Century Belle-Époque or Victorian-Aesthetic. They are also clear pre-cursors of Liberty-style, Moderne, & Art-Deco. Even more flamboyantly Deco are Otto Czeschka’s 1910 Bracelet & Dagobert Peche’s neo-rococo1920 Pendant. Your Scribe won’t be able to make the train-journey up to Fordham Road in the Bronx until the week after this report is filed, so just-for-the-record these are two separate installations, both intriguing, now that the Weather has improved somewhat. You can, of course, call the Garden for opening-times & other info. Even without special-shows, it is always worth a visit: much, much larger than Brooklyn’s nonetheless admirable Botanical Garden. It is not true that Abstract-Expressionism killed-off an American-Passion for Orientalisme. Nonetheless, in Late-Victorian-Times—not only in Manhattan, either—rich Americans had to have at least a Turkish-Corner, if not an entire room decorated like a Caliph’s Harem. The richly-detailed canvases of Sir Lawrence Alma-Tadema could offer decorative-clues. Other artists working in the Tradition of Orientalism were also prized, as were even Arab-Garments, jewelry, textiles, & rugs. Even Advertising & Stage-Spectacles employed Arab/Turkish themes, as exemplified in some graphics in this interesting Backward-Glance at Old New York. This later spilled-over into the Cinema: The Thief of Baghdad, for instance. Iran & Iraq, as such, weren’t even On-The-Map. Sa’udi Arabia did not yet exist. The Ottoman Empire of the Turks—extending from the Middle-East down the Arabian-Peninsula, across Egypt & North-Africa to the Pillars of Hercules—was the Mystical-Terrain that inspired trips to Cairo & Constantinopole, formerly Byzance. Broadway sported Minarets on some theatre-temples, which themselves looked like Moorish-Fantasies. O’Henry called Manhattan Baghdad-on-the-Subway. 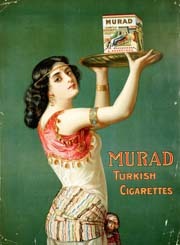 People smoked Murad-cigarettes: Turkish-tobacco was prized. Even in Death, some prosperous New Yorkers opted for Middle-Eastern motifs in their Tombs & Mausolea. The Temple of Philae on the Nile was copied for Jules Bache. The Woolworths also favored Egyptian-Temple-Architecture! With the regrettable recent-closure of the Dahesh-Museum—devoted to 19th century Academic & Salon paintings & sculptures with Oriental-Themes—it is good to have at least a Turkish-Corner over on the Corner of Central Park West & 79th Street! Bridal Veil, Central Asia (Tajikistan), 18th or 19th Century, Cotton, silk embroidery, 86 x 68.5 cm (34 x 27 in. ), From the collection of Bruce and Olive Baganz. As a Companion-Piece to the Orientalism exhibition, members of New York’s Hajji Baba Club have loaned the Historical-Society an amazing selection of Rugs & Textiles from the Middle-East & even Central-Asia & the Indian-Sub-Continent. There is even a colorful Robe from Uzbekistan, a Gujarat Patolu from India, a Bag-Face from Iran, a Cover from African Mali, a Pair of Uk Bash from Kyrgyzstan, & a Baby-Carrier from Ghuizo-Province in China. 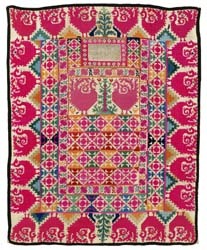 There are some Visuals showing how rugs & textiles are woven in various cultures. In Turkey, young girls swiftly weave the threads in & out of the warp. But when they are about 13, their fingers may have grown too large, or their eyesight may not be as good as before. Although Ali-Baba was famed for his Flying-Carpet, none of the rugs in this show is ready for Take-Off. In fact, his name is not invoked by the Hajji-Babas, whose name reflects the honorary-title of a man who has made the Hadj, or Pilgrimage, to Mecca, site of the Ka’aba. Reviewers have been ecstatic about the photographs of Vanishing & Evolving New York on view in Eminent-Domain, now in Gottesman Hall of the NYPL. 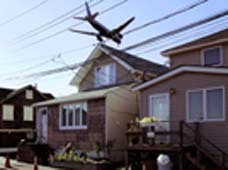 The legal term, Eminent Domain, is currently much in use in Manhattan, where some large-scale building-projects may require official Condemnation of Private-Property—at fire-sale-prices—for the imagined Public-Good. As the city changes, photographers have been recording those developments, for better or for worse. Central to this show are the photos of Thomas Holton, Bettina Johae, Reiner List, Zoe Levitas & Ethan Lewis, with a special set of commissioned Narrative-Panels by Glenn Ligon: Housing in New York: A Brief History. 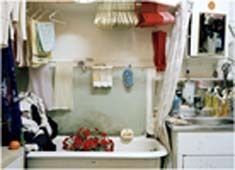 Thomas Holton: “Untitled” from the series The Lams of Ludlow Street, 2004-2005, Ethan Levitas: Untitled/This is just to say, 2006, Bettina Johae: from the series borough edges, nyc, 2004-2007, Reiner Leist: “September 12, 2002” from the series Window. 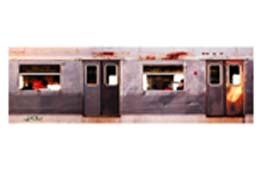 Ethan Lewis’ long-prints of Subway-Cars are titled Untitled/This is just to say. It occupies the run of the rear-wall of the Hall. These color-photos catch passengers "in various forms of private & public life." And why not? 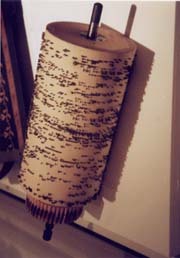 Reiner List offers a wall crammed with tightly-marshalled photos of Scenes from his Studio-Window, taken daily from March 1995. At different times of day, for variety… When he couldn’t do it, there is a black-rectangle to indicate that lacuna. Holton zooms in on The Lams of the Ludlow Street, at home & abroad in Hong Kong & China. On some 27 bike-rides around the perimeters of the Five-Boroughs, Bettina Johae has captured scenes of New York known to few. Zoe Leonard’s interest centers on the Lower East Side & the Rag-Trade & Brooklyn, including disappearing shop-fronts & other arcana. [Your Scribe’s enthusiasm is a bit tempered as he has also been photographing New York since 1960, especially the demolition of old-buildings, the holes they leave, & the High-Rises that follow. [But I do not do People—issues of their Privacy. Instead, Architecture, Ornament, Decoration, Patterns, & Art are my Main-Targets, with INFOTOGRAPHY™. [I offered my entire collection of photos, taken around the world over fifty-years to the NYPL Photography Collection, but was turned-down on the grounds that the Library couldn’t service my collection. [There are now over 350,000 Slide, Print, & Digital-Images in the Collection. Fortunately, it is being scanned for the website INFOTOGRAPHY.BIZ. 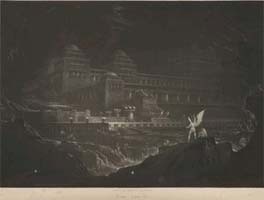 The Palace of Pandemonium, a mezzotint by John Martin, from an 1853 edition of Paradise Lost. NYPL, General Research Division. The title of this concentrated-survey of John Milton’s Works & his Subsequent-Influences isn’t intended to suggest that He is now Living on Another Planet at a Happier-Time than his own, when he was briefly imprisoned for his writings, with his books condemned by Royal-Order. No, indeed! On the 400th Anniversary of his Birth, there are some 350 years’ worth of adaptations, interpretations, performances, & parodies of his brilliant literary-visions. Some of these are noted in this exhibition, but it is more interesting for its first-editions & personal Miltonian-Memorabilia. The NYPL has a copy of that famous painting of Milton’s Daughters taking-dictation from their blind father to record Paradise Lost. This exhibition makes a point of correcting mis-impressions of Milton & His Family-Life. Milton’s poetic-evocation of the Fall of Lucifer, the Angel of Light, has apparently had more visual-influence on artists who came after him, than his Visions of Heaven. Both the Visuals & the Texts in this exhibition are well worth some study, but there also a handsome free brochure containing period-illustrations & focusing, as does the show, on Classical Milton, Influences, Romantic Milton, Modern Milton, & Musical Milton. Magnolia Grandiflora, by Jenny Phillips, 2005, watercolors, 15½ x 11½. (c) A.G. Carrick Limited 2007. Recently, a most unusual & instructive exhibition was on view at the NY School of Interior Design: 75 highly-detailed watercolors of selected plants growing in HRH The Prince of Wales’ gardens at Highgrove. This was the only showing of these remarkable drawings commissioned from 46 internationally-known artists. If you missed this show you can enjoy these Botanical-Plates—and many more—in the Privacy of Your Own Home by purchasing one of the immense volumes of the Limited-Edition of the Highgrove Florilegium. Copy No. 1, signed by the Prince of Wales, was also on view at the School. The actual volume looked quite as large as Audubon’s Birds of America. It is the latest in a long line of distinguished Florilegia, which include Besler’s 1613 Hortus Eystettenis & Robert Thornton’s Temple of Flora, produced from 1799 to 1807. Banks’ Florilegium, inspired by botanical-discoveries on Captain Cook’s First Voyage, was delayed for 200 years before publication, even though the plates had already been engraved! The famed Flora Danica took 122 years to complete. So Prince Charles’ Project has been discharged with exemplary speed. The Highgrove Estate has 15 acres of gardens. When Charles & Diana married, they were given Kensington Palace as their London-Residence, but they needed a get-away Country-Place. Highgrove was chosen, so it also has associations with the much-beloved Princess Diana, who loved the gardens! Some well-heeled Collector has just paid a new Top-Price for a Francis Bacon artwork! Triptych sold at Sotheby’s on 14 May for $86.3 million! That was the Summit of Sotheby’s sales of Contemporary Art, followed by Yves Klein’s Gold Leaf on Panel for $23.5 million. Abstraktes Bild, a muted-pastel-spectra over-smeared with brownish-schmutz by Gerhard Richter sold for $15,161,000. The just-deceased Robert Rauschenberg’s Overdrive achieved $14.6 million, with Andy Warhol’s Detail of the Last Supper fetching only $9.5 million. If such sales are less about the Art Itself & more about Capital searching for secure Havens, so be it. But Bacon, Richter, & Warhol are still a Long Way Off from the $135 million the noted Jugendstil collector, Ronald Lauder, paid for Gustav Klimt’s Die Goldene Adele, now on display in his Neue Galerie. But, if America is slowly—or increasingly-rapidly—descending from Recession into a Depression, possibly worse than that of the 1930’s & the Inflated Art-Market begins to deflate, how many Millions of Value will then Vanish? At the bottom, If you finally desperately need to buy a loaf of bread & a quart of milk, can you cut up your Van Gogh into small blue & yellow squares to use as Currency? Considering USB’s recent & catastrophic Financial-Reverses, it is admirable that this major Swiss Banking-House still maintains the handsome two-aisle gallery on the Avenue of the Americas, formerly known as Sixth-Avenue, where once the El impeded the filtering of daylight into the street below. The new exhibition—following the excellent exploration of Wedgewood Ceramics—celebrates the 50th Anniversary of Lincoln Center but, more-specifically, Vera List’s creation of the Lincoln Center Poster Program. 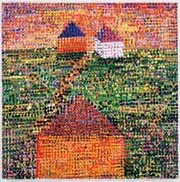 Houses by Jennifer Bartlett, 2005. Vera List’s Brilliant-Idea was to commission Outstanding-Artists to create Original-Artworks on Paper that could then be adapted as Posters for various Lincoln Center Events! Now some 60 special-edition prints & 10 fine-art posters are on view just off Sixth-Avenue, complete with a handsome free-brochure! Ranging from the program’s-inception in 1962, through 2007, the artworks celebrate such evolving styles as Minimalism, Pop-Art, Color-Field, & Abstract-Expressionism. Among the Anointed-Artists are Chuck Close, Alex Katz, Andy Warhol, Ben Shahn, Jacob Lawrence, Robert Rauschenberg, Larry Rivers, Frank Stella, Joel Shapiro, Jules Olitski, Gerhard Richter, Marc Chagall, & Elizabeth Murray. There is also Helen Frankenthaler’s suite of six silk-screen-prints, the largest single-artist-holding in the List Collection! New Yorkers may remember some of these artists’ Distinctive-Styles on posters for Mostly Mozart, Live From Lincoln Center, & other LC programmatic-events.